Exciting news, my new Etsy shop and blog are now up and running! This IG account will revert to my personal one. Please follow my new adventures on @eleanor_grace_uk -look forward to seeing you there! After my latest visit to Marbella and another round of the haberdashery stores, I came away with some new ideas and some fantastic cottons. First up is one of my new projects using more of the fabulous Marbella Cotton which I bought last time. I’ve decided to make a range of vintage-style cotton shoppers – in the UK as in many places, we’ve become more aware of the use of non-recyclable and plastic bags and so I thought these would be a welcome addition to my range. These bags will be finished off with straps and lovely large buttons with some ribbon or cord threaded through the top. 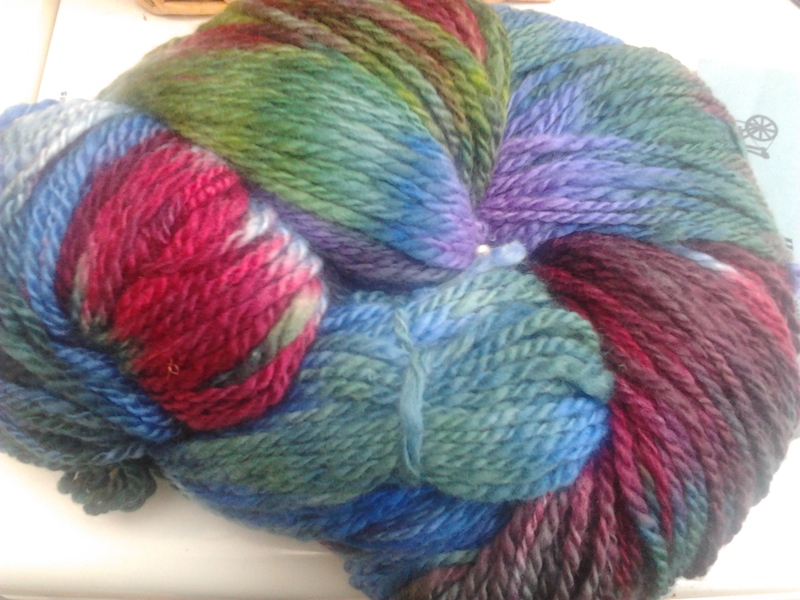 As a true yarn freak, I couldn’t help myself but buy, erm, a few more cottons in various colourways – oops! 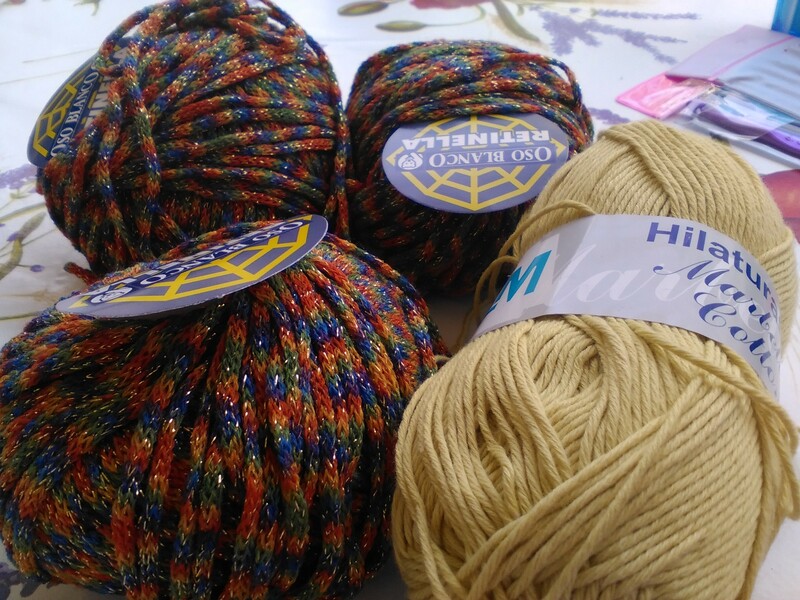 My next project is to make a few different versions of my favourite shawl – the original grey one is in a cashmere/cotton blend which makes it a bit on the pricey side, so I felt that a range of different yarns would suit all pockets. These lovely cotton yarns in coral and soft pastel pinks and blues (again from Marbella) will certainly fit the bill. I shall be delving into my stash to find some other possibles. 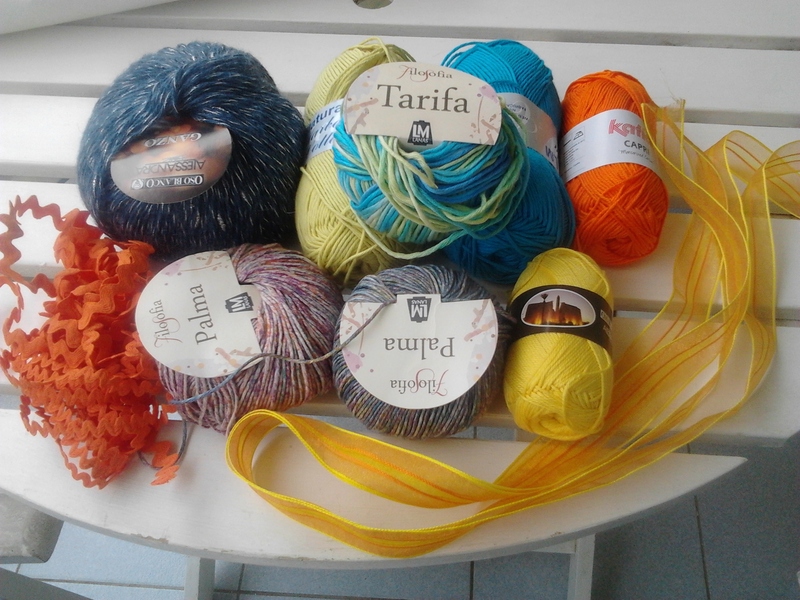 Finally the post-holiday blues meant a visit to my favourite local yarn shop – Marmalade Yarns – I must truly be a regular as this time I earned a discount – yay! I came away with the three gorgeous yarns above – without a definite plan for them other than I can see them all as lovely wraps or shawls. First is Fyberspates Vivacious 4Ply, a 100% superwash merino in ‘Sunshine’ – a yellow which is just so bright and spring-like, it makes me smile just to look at it (the test of a true yarn-mad person). The next yarn is Skein Queen Entwist 4ply, another 100% superwash hand-dyed merino in Emerald Lies, a breathtaking mix of gorgeous greens. And finally, Rowan Fine Art in Pheasant – a beautiful mix of autumnal colours – reds browns and chestnuts. So, you would think I have enough to be going on with, but I also have some other plans that I have been working on (more of them later in the week!). Marbella is a lovely resort which has been revived and refreshed to something more like its 1960s heyday (although, thankfully you don’t need to be a millionaire to go there now! 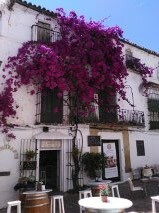 Apart from the miles of golden beaches, the main draw of Marbella, for me, has to be the Old Town. The Old Town is a winding maze of cobbled streets, cafes, restaurants and shops, selling everything from linen and cotton clothes and home furnishings, to local artisan shops and designer handbags, with wisteria, bougainvillea and hibiscus spilling over you from the balconies above. 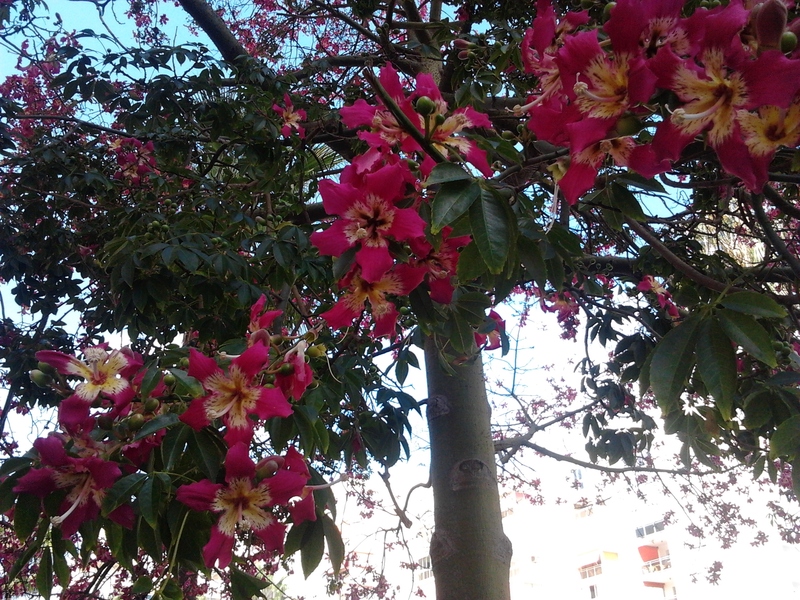 Only 45 minutes away by a very reasonably priced direct bus, is Malaga, birthplace to the artist Pablo Ruiz y Picasso. A beautiful city with architecture old and ancient a-plenty to feast your eyes upon, including this beautiful former Hospital and the Roman Amphitheatre ruins. As Picasso’s home town, there are a number of Museums / Art Galleries – we decided to go to the Museo Picasso Malaga – which appeared to be the largest, but also had an additional exhibition on which we wanted to visit. I must admit to never having been a big fan of Picasso, from the few pieces that I have seen, but my view has definitely shifted now, having seen the range of oeuvres including sculpture, ceramics, print-making and his early, more naturalistic paintings. The additional exhibition was a touring exhibition called Energy Made Visible, focusing mainly on Jackson Pollock’s Mural which was commissioned by Peggy Guggenheim for her New York abode. Although I love Pollock’s drip painting, it was one of the rare occasions when the other exhibits – including those who both inspired and were inspired by Pollock – were more interesting than the main feature. There were works from artists and photographers that I did not recognise, such as Barbara Morgan, Herbert Matter and this painting by Antonio Saura – La Grande Foule (the Great Crowd) which made more of an impression on me than Pollock’s work. Initially this looks a bit bleak, but in reality the faces vary from comical to the downright scary. Being a complete geek, I couldn’t help but see a misshapen Darth Vader in the figure on the bottom row, just before the half-way mark. 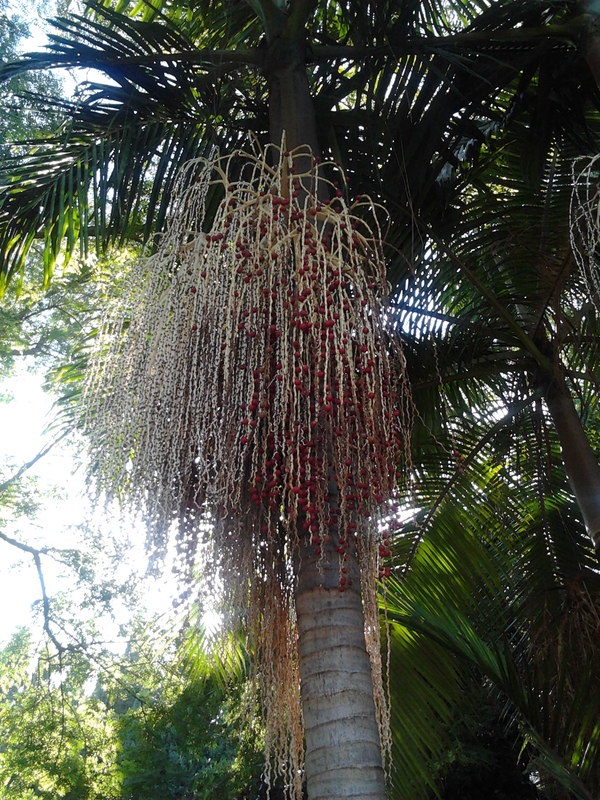 Can you spot him? My final surprise was to see a work by Andy Warhol, another artist who I have always thought was over-rated. This work, entitled Yarn Painting was so eye-catching and bold. Regular readers will know why I laughed when I found out the name of the work – as a mad-keen crafter, I spend half of my time looking at or working with fibres and yarns! This exhibition is on in Malaga until 11 September so, if you get a chance, take some time out and enjoy Andalucia! Two colds and a hefty dose of Flu have reduced my capacity to be able to post for a while. Thankfully all better now! For now you will have to content yourself with some beautiful pictures of Marbella, including an Andy Warhol piece entitled “Yarn Painting” which of course was my favourite piece in the Picasso Museum in Malaga. Well, I’m pretty much unpacked and back to normal (ish) after my trip to Marbella with Mum. The dull British weather has certainly brought me back down to earth with a bump! I managed to find the haberdashery/wool shop again in Marbella, but was a bit disappointed with their lack of range. I did manage to find one yarn that I really liked – Retinella by Oso Blanco. It’s a mix of Merino and Acrylic with a bit of Polyester to add a bit of sparkly shimmer. It feels like an Aran / Worsted weight but knits up as Bulky. I’m making a stretchy V Stitch crocheted scarf with this. I also bought some more of the Marbella Cotton which made up lovely coasters which I left at the Marbella apartment last time and was glad to see that they are still there being used! On our last couple of days we wandered around trying to find a shop that we had seen earlier in trip. The Old Town in Marbella is full of windy cobbled streets which all look the same, but I have a pretty good sense of direction (usually!) 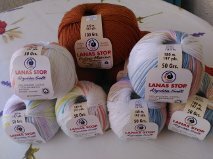 We found the shop but on our way discovered another Wool Shop which had a fabulous range of Lanas Stop yarn. 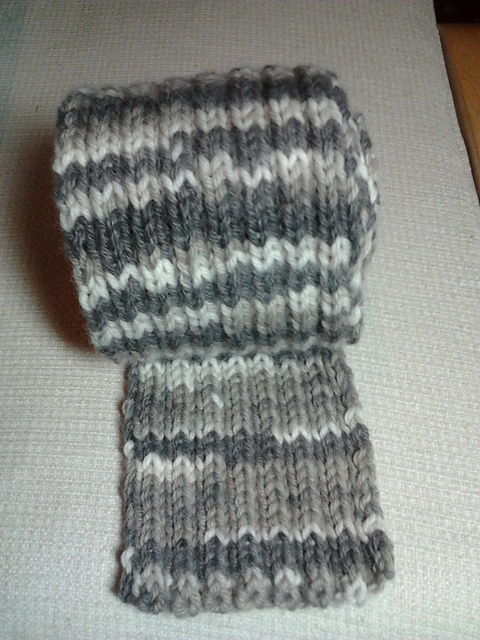 This is really good quality stuff – I bought some in Bath and it cost me a fortune, but made up this lovely simple ribbed Alpaca mix scarf for my Dad when I first learnt how to knit. So I went a teensy bit mad, bought some gorgeous Extra Merino double knit in burnt orange, to make a scarf for Mum, and Algodón Soft which is 3-4 ply and I’m not sure what to do with it but I’m sure it’ll make something very pretty. More news to follow about my Etsy plans and also naughty cat behaviours! 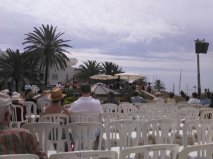 Orchestral Manoeuvres in the Park (erm, Seafront)! What a fabulous week it’s been – a fabulous trip to Marbella in Andalusia, Spain, with Mum for a week, relaxing and chilling out. we spent most of our time wining, dining and watching the world go by in cafes and restaurants! 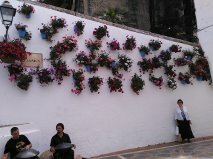 The walls of the old town in Marbella are covered in beautiful pots and climbers – geraniums, bougainvillea in vibrant pinks, reds and purples. The Moorish influences and winding alleys with restaurants, shops and apartments are absolutely fascinating. We spent most of our time here rather than the seafront. Everywhere there was music and dance – a dance festival was running all week and most of the events were free and on the street. Those in the UK will remember the TV Show “Name That Tune” will appreciate it when I say – I name that tune in two! The first two notes of the piece when Luke Skywalker is looking out at two of the moons of Tatooine is apparently called Binary Sunset (starts at about 00:30 on this version) and is a beautiful piece of music. I had to get the bill pronto and dash across the street to catch them complete a medley of all of the Star Wars music. My belief (slightly controversial, I know!) is that John Williams is the finest composer of all time. What a wonderful orchestra they were – for the next two hours they played a wide range of music from Mozart and Beethoven to baroque and another of my favourites – Danse Macabre by St Saens (used as the theme tune for the brilliant TV show Jonathan Creek). The most remarkable thing was that they were the Malaga Provincial Youth Orchestra, and none of them was over 18. I wholeheartedly recommend Marbella for a holiday, especially out of season, they are so proud of their town and it is kept so clean and there is a high police presence, so you feel pretty safe (main issues seem to be pickpocketing). 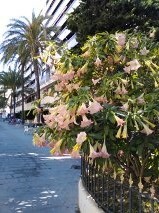 I’ll update later in the week with the crafty happenings in Marbella and further gossip! 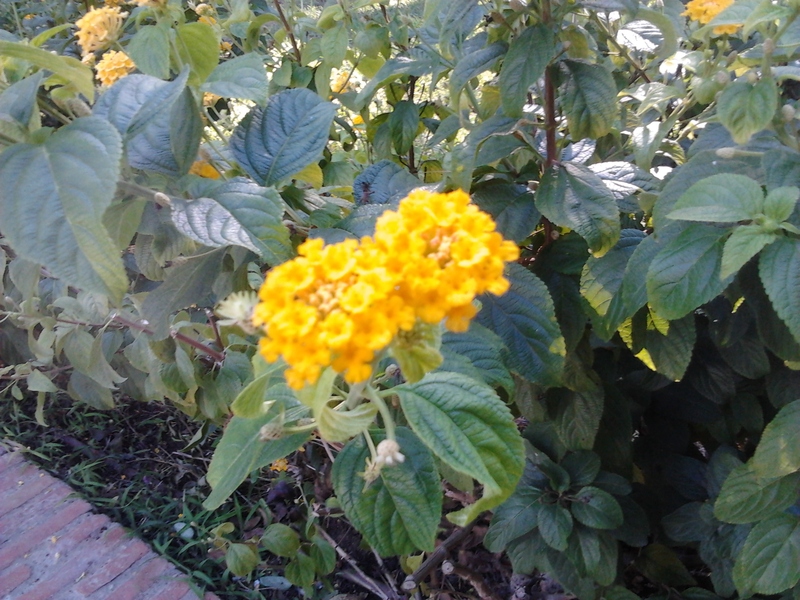 Nature and colours have always been fascinating to me – why is it we are often drawn to similar colours or combinations? I’ve just returned from a lovely week in beautiful Marbella in Andalusia, it was a very inspirational trip in more ways than one. I often find I get stuck in a rut of using these (albeit gorgeous!) colours to the exclusion of others. Of course, not everyone has the same taste as me! 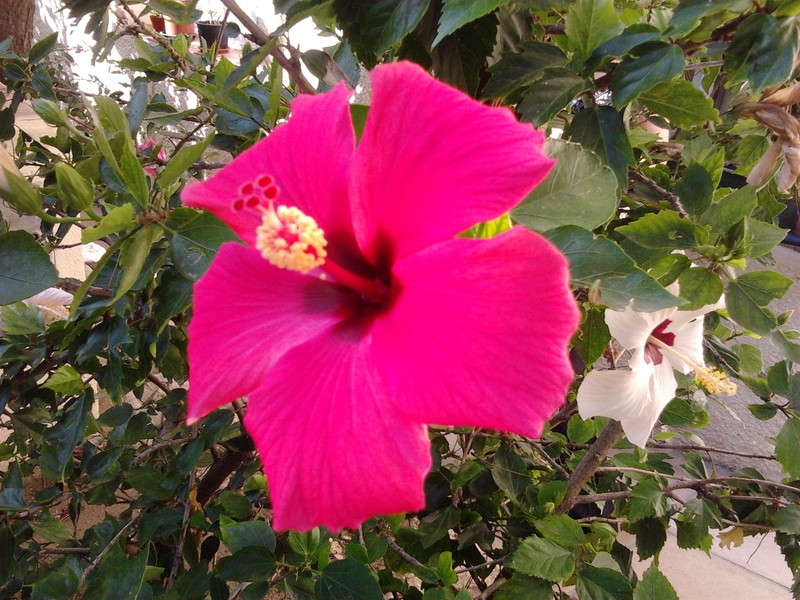 But this late Summer break has turned my head (and I don’t just mean the handsome Spanish waiters!) – I seem to have a new fixation on fiery latin colours… The latin culture and bold nature and colour schemes all really appealed to me. 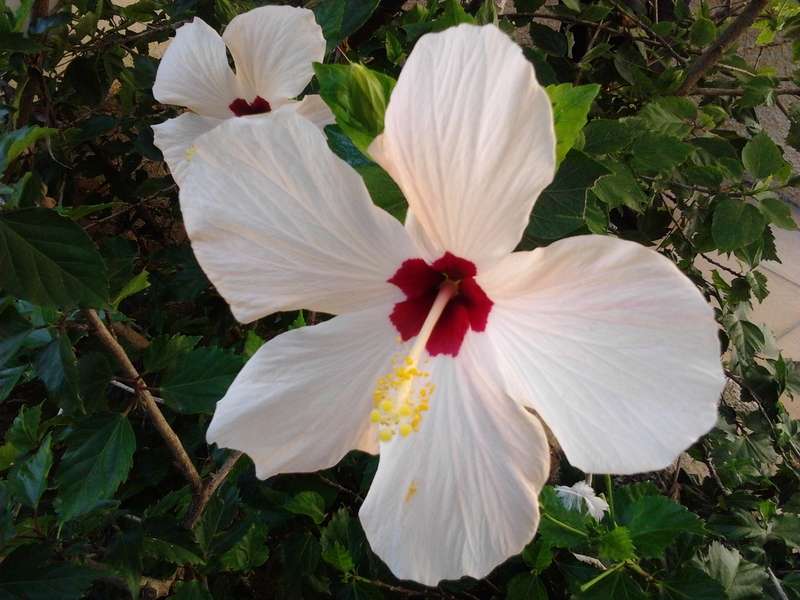 Just look at these bonkers white and pink hisbiscuses (am I the only one disappointed that the plural is not hibiscii!?) 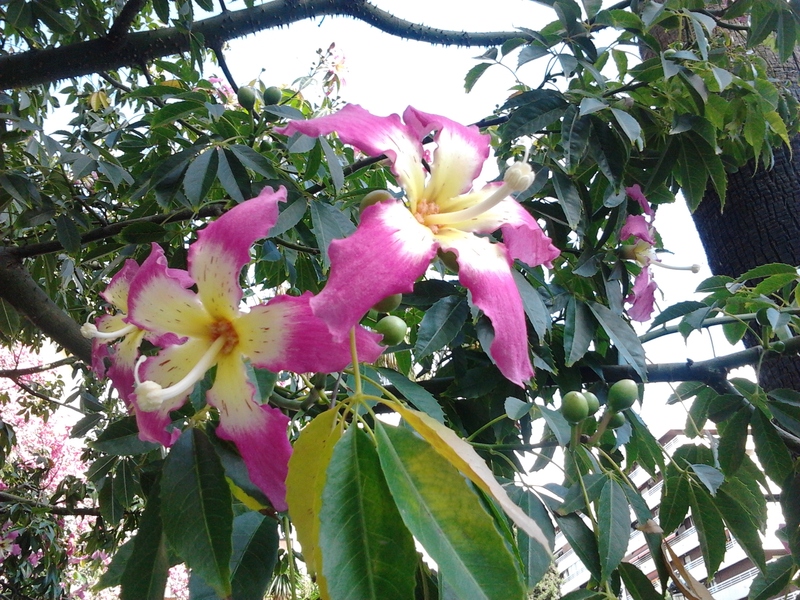 – and the trees – not sure if they are also hibiscus but they make quite a show of themselves! The planting schemes in the parks was what I like to call “bonkers” but extremely cheery. Most of my week was spent in the Old Quarter – with cobbled streets, gorgeous knicky-knacky shops and – joy of joys – two haberdashery / wool shops. This naturally resulted in some distinctly latino colour schemes in the resulting purchases and plenty of inspiration to take me into the colder months. I’m sure I’m not the only one with a natural preference for certain fabrics, colours or styles! 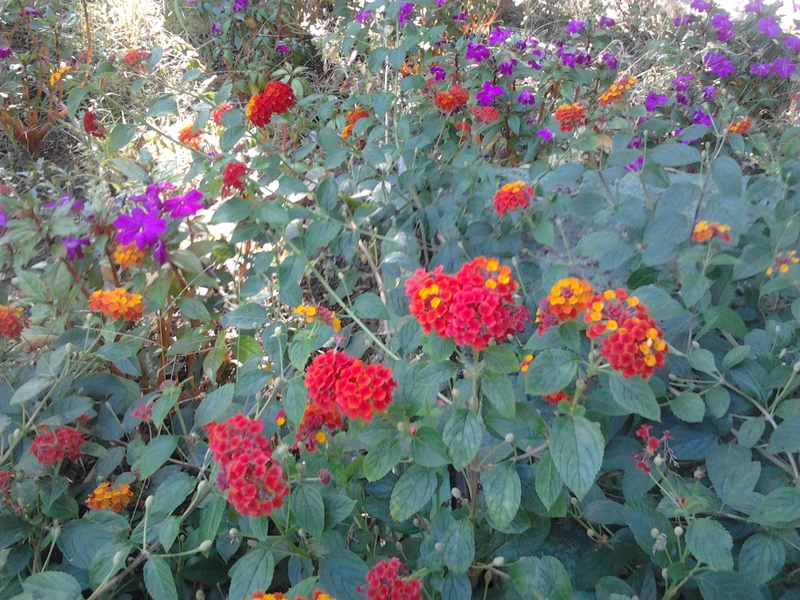 Latin Colour Inspiration – Fiesta or Siesta! ?